This is a story about the little guys, living amidst this flux. Most of them are old school residents of Hell's Kitchen who are struggling with their day to day lives, addiction, regret, and survival. The rules are changing, whether they realize it or not. In these three days in the late '90s, a tipping point is reached, and in their own ways each must adjust, but how? JEFF AWARD WINNER: "Best Ensemble"
"An evening with homeless junkies and rough trade probably shouldn't be this good." "Schultz's blistering production is part of the storefront scene's decade's long tradition of excelling at, as it were, ghetto Chekhov...to single out one cast member would do an injustice to the other ten." "Eleven actors seem to erase everything they've been to become 13 sad survivors drifting through three perfectly pointless days. Authenticity this precise thrills." 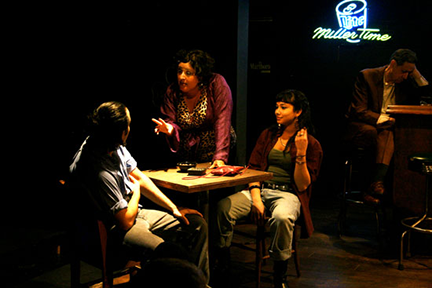 "Excellent ensemble acting under Joanie Schultz's tight direction makes for a powerful drama that'll give you chills. Steep Theatre's production is first-class." "hilarious, brilliantly agonizing play...an excellent ensemble effort"
"Whatever you do, do not miss this play."